We’ve got everything you need to throw the maddest Alice in Wonderland tea party - from costume ideas to decorations and games. What better way to celebrate all things Alice than by throwing your own Alice in Wonderland tea party? You'll find everything you need below to make your party fit for even the maddest of Mad Hatters, including Alice in Wonderland costume ideas, decorations and games. And no Alice in Wonderland afternoon tea party would be complete without jam tarts, so take a look at these Wonderland inspired recipes for inspiration. 1. Place the large diamond template onto coloured paper and draw around it, then cut out the shape. 2. Cut out as many diamond shapes as you will need to make flags for your bunting. You could use lots of different colours and patterns, or white, red and black, just like playing cards. 3. Fold all your diamonds in half to make triangles. To make folding easier, score a line onto the card first using a ruler and the point of a pair of scissors. 4. Lay the string out on a table and place your folded diamond flags over the string. The flags should be equally spaced, a few centimetres apart. 5. Open up each diamond and stick the string to the inside fold using sticky tape. Then glue the flags down into triangles. 6. Now make the shapes to decorate your flags. 7. The small card templates are the four suits of playing cards: hearts, spades, clubs and diamonds. 8. Draw round these onto contrasting coloured paper and cut out the shapes, then stick them onto your bunting flags. Attach Drink Me and Eat Me labels using ribbon or string to bottles, teacups, bowls, plates and anything else that holds food or drink. 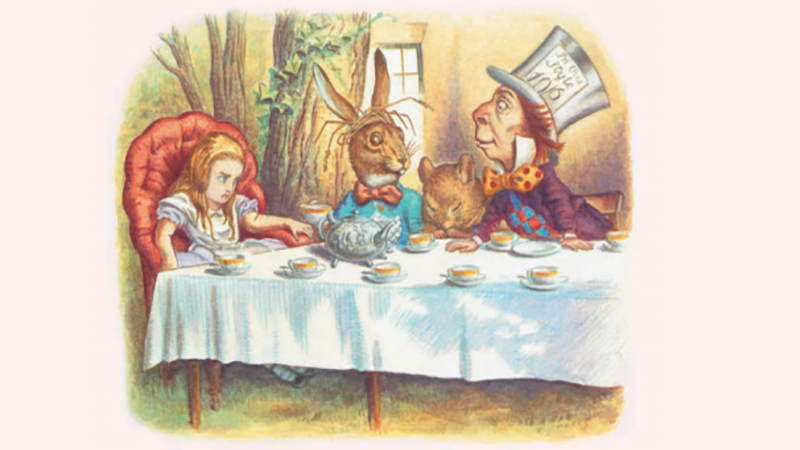 Remember, nothing matches on the Mad Hatter’s table so use an assortment of different sized cups, plates, bowls, even teapots – anything goes. Use a chessboard as place mats and scatter playing cards or shapes like hearts and clubs on the table. Look the part of the perfect hostess with an alice band, blue dress or skirt, striped socks or tight and black shoes. Add a white apron for the full Alice effect. These White Rabbit ears are perfect for party guests and they're easy to make. Complete the White Rabbit transformation with face paints to paint on a pink nose, white cheeks and black whiskers. Everyone has to follow the orders of the Queen of Hearts or it’s ‘Off With Their Heads’. Play this game like Simon Says; if you don’t do what the queen says then you are out. The last one standing is the winner. 1. Divide the players into two teams. Give one team all the black playing cards, the other team all the red cards. 2. Each team divides the cards up between their players, so that everyone has a turn. 3. Each team makes a line on either side of the hat, about a metre away from it. 4. Somebody shouts ‘Go’ and the first player on each team starts to throw their cards one-by-one at the hat, trying to get them inside. 5. Once that player has used up all their cards, the next player in their team starts throwing. 6. Both red and black teams can throw their cards at the same time, so there will be plenty of flying cards! 7. The game continues until one team has thrown all their cards, at which point the other team must stop. 8. The cards inside the hat are then counted to see if there are more red or black. The team with the most cards in the hat wins. This book is brimming with suggestions for decorations you can make, instructions for games to play and ideas for costumes; there are even simple recipes so you can have the perfect Mad Tea Party! Plus press-out decorations and over two hundred stickers.